Me too. Great guy. And congrats on making it to 4,000, Ryan!!! Being in the USA, anyone know where I can get one of those Rooftop Batman figurines that Eaglemoss gave away with the UK subscriptions? I picked up my Robin figurine today and inside the magazine was this ad. This is the Robin figurine i picked up today. Looks tall. Is that Tim Drake? Is he an adult already? Green Lantern this week !!! 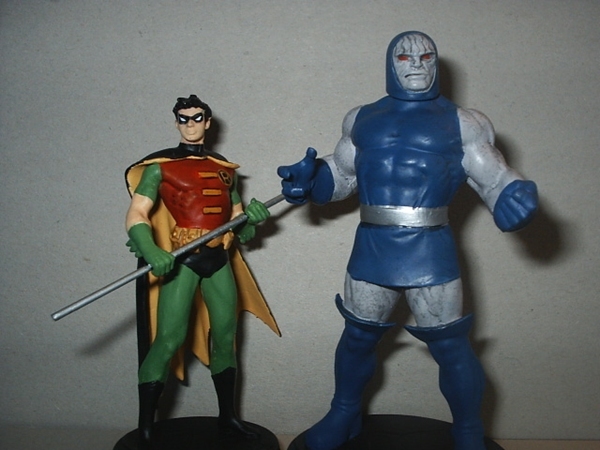 Not a fan of that Robin, but Darkseid looks great! released. Be weird if I won! Darkseid with grey arms and legs! Hallelujah!!!! include an arrow pointing at their crotch? Well, back in the 80's, their slogan was, "DC: Where the Action Is." time were Justice League of America and Legion of Super-Heroes. Well, the JLA is almost complete ! I got Green Lantern last week and Wonder woman is expected next week. Looks like the UK and Ireland are already seeing Darkseid in stores. Thanks to irish legend on the figurine forum for the pic. Wonder Woman next week in France? Thanks for the tips, Richard. I still don't know when Darkseid will be released. I picked this Darkseid model up today and took a picture. He's a good head taller than Superman in the photos I've seen, and just taller than the Hulk.